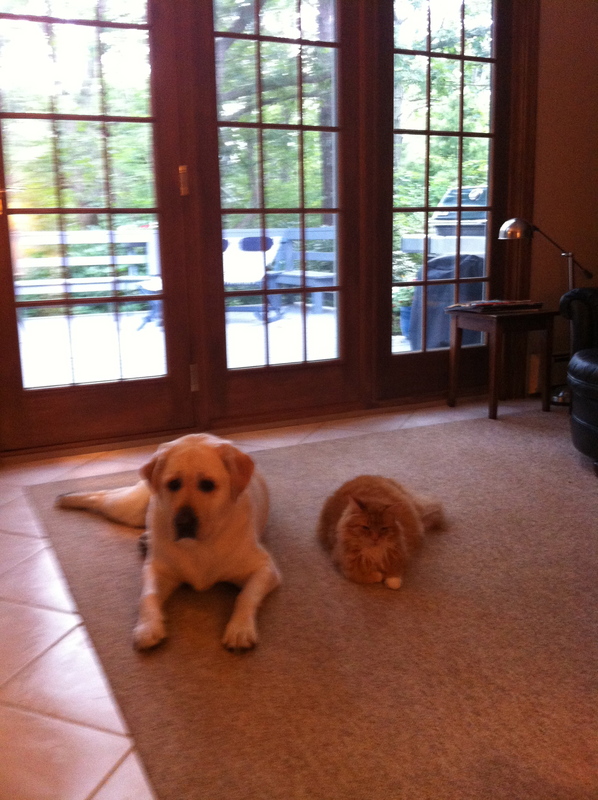 Daisy and Sam do much more than co-exist in the same house. They seem to have really bonded. This morning, Sam was drinking out of Daisy’s water bowl. I watched while Daisy stood patiently behind him until he was finished. Then she got a drink for herself. Sam returns the favor by sitting patiently while Daisy licks him from head to foot. He seems to understand that Daisy is just trying to get him to play. It’s funny to watch. He adopts an attitude of forbearance until Daisy is finished. We often find them asleep in the same room when we return home. Often in our upstairs bedroom. Sam on the bed and Daisy curled up on “her” chair. It’s as though they choose to be together rather than alone. Is this friendship? You know, I really believe that it is. This entry was posted in Daisy, Sam and tagged Daisy. Bookmark the permalink.